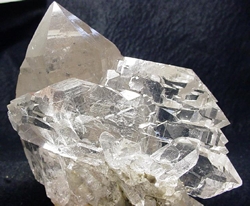 Quartz crystals, usually clear quartz, are typically the first crystals one works with when beginning to explore the use of crystals in energy work or healing. Quartz amplifies energy and many tools used in energy work are made from quartz, such as pendulums, crystal balls and singing bowls. Many wands have a clear quartz crystal tip. The use of quartz in spa products and services is becoming more mainstream as people discover the benefits of using quartz crystals to heal on all levels (physical, mental, emotional and spiritual) and manipulate energy in and around the body. Quartz crystals are particularly beneficial and powerful when used in energy healing. Amethyst, which aids in psychic development at the spiritual level, alleviates grief at the emotional level, aids in addiction recovery at the mental level and helps correct lung and respiratory tract issues at the physical level. Also on the physical level, it can help with intestinal problems, including parasites. Citrine, which, at the spiritual level, promotes self-confidence and personal power. At the emotional level, it enhances feelings of joy for living, making one feel empowered and out-going. Mentally, it aids in understanding the self and in personal growth. At the physical level, it aids digestion, working on the stomach area and boosting the pancreas. Smoky quartz, which spiritually boosts the ability to deal with stress. It provides strength in difficult times. Emotionally, it relaxes and shields against further stress. At the mental level, it helps you focus and evaluate. Physically, it reduces discomfort, especially in the back. It is also said to protect against radiation and improve damage that results from radiation. Rose quartz, with its pink colour, is associated with the heart chakra and love. At the spiritual level, it promotes gentleness and pleasantness. At the emotional level, it provides empathy and a loving nature, whether it is love for the self or for others, including romantic love. At the mental level, rose quartz eases worry and helps with discernment. Physically, it is associated with fertility and strengthens the heart. There are various ways to make use of quartz crystals for healing. You can include crystals in your meditations, to help boost your energy or work with your energy to promote healing and enhance your meditation experience. You can either put the crystals around you, on your body in the appropriate area or just hold them in your hands while you meditate. Some people use crystal singing bowls for healing and relaxation during meditation. Crystal therapy sessions are available from some holistic practitioners or spas. This involves laying the crystals on or around the body in a variety of patterns, depending on what the client needs, and then allowing the crystals to do their work. Sometimes, the practitioner uses Reiki or another energy healing modality to enhance the session. Note that if the placement of a crystal ever feels uncomfortable anywhere on your body, whether you have placed the crystal there yourself or a practitioner has done so, then remove the crystal, or let the practitioner know that you would like to remove the crystal. Sometimes, the energy from a crystal can feel overwhelming, especially if you are very sensitive to energy. I have encountered a few people who experience pressure or the feeling that they are getting a headache when placing an amethyst on their third eye, and putting clear quartz crystals under the pillow at night can cause insomnia in some individuals. Quartz crystals used in jewellery continue to contribute healing properties to the wearer. Keeping the stone in your pocket and handling it will also allow it to interact with your energy field, though if it is worn over the clothing, the clothing will act as a barrier. It is always better to have the crystals touching the skin whenever possible. Elixirs also referred to as essences, are made by putting the crystal in purified or spring water and allowing the essence of the stone to be transferred to the water. The water, with the stone, is then left to charge in sunlight; Gienger recommends setting it out at sunrise and sunset, and then using the elixir in the bath or even taking it internally, provided the stone used is non-toxic. Quartz crystals are also used in aromatherapy mixtures. It is possible to find aromatherapy crystal elixirs already made. Some spas, such as the Ho’ola spa at the Sheraton Keauhou Bay Resort, carry aromatherapy elixirs and use them in massage therapy and other treatments for their clients. They have a mix of oils that include a clear quartz crystal in the bottle to increase the effectiveness of the aromatherapy oils. Clear quartz is a powerful energy booster that strengthens the ingredients in the mix. Be aware that some crystals are toxic, and should not be used in elixirs. Malachite is an example of a stone that should not be used directly in an elixir but can be used indirectly by putting the malachite in a container and then putting the container in the water. As well, some crystals will fade in sunlight (amethyst) or dissolve in water (selenite). Always verify with a qualified expert what you can do with the stone you are planning to use to make sure that you are maximizing its benefits and avoiding any toxic effects. Gienger, Michael, Crystal Power, Crystal Healing: The Complete Handbook, New York: Sterling Publishing Co., 1998. Hall, Judy, The Crystal Bible: A Definitive Guide to Crystals, Cincinnati: Walking Stick Press, 2003.